Our new booth showcased a lighted ceiling dome with carbon fiber flat panels, accompanied by a carbon fiber ceiling grid supported by our latest carbon fiber structural profiles in combination with our carbon fiber tie-rods. This display also demonstrated our environmental control system design and manufacturing capability by integrating our ECS components. 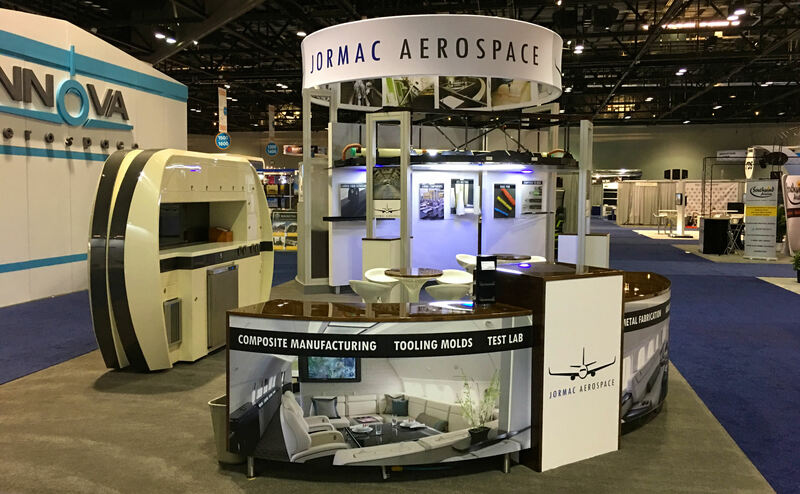 Jormac's booth also featured a VIP G4B Galley, which provided a hands-on, interactive demonstration of our galley design, manufacture and finish capabilities. Our cabinet build and finish expertise was also emphasized by the updated wood veneer finish applied to our booth cabinetry and tables. Use the contact page on our website to request more information for any of our services and product deliverables including the application of our carbon fiber technology for your aircraft.